Look what I came across when I was in Japantown last weekend, matryoshka packing tape! It was so cute that I bought one for me and another roll for one lucky reader to win. Some things you just have to share. Congratulations to Rosana Garcia Hess who won the giveaway! Thank you to everyone who participated. I had fun reading your comments. crocheting. thanks for the chance! Knitting. The tape is adorable. 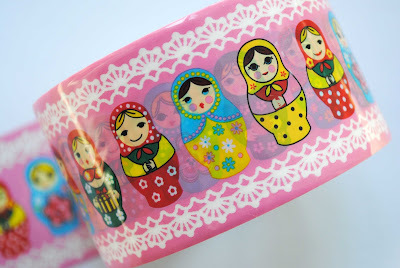 I love glueing matryoshka doll tape on everything. What a coincidence. I like the craft work you did for your daughter, the knitted hat (the one with the hole for the ponytail),that was absolutely original and could be the next fad! Very innovative and creative. I really enjoy crochet ... and of late Mod Podging things. I like many crafts. Knitting, sewing, making things out of paper, notebooks making, cooking, and so on. I love to sew, to fold paper (origami), to draw and paint, to cook, to do scrapbooking...but my favourite is definitely sewing !! Oh how cute, this matrushka tape. I love it. I really like Crochet. I started for about an month ago and got addict to it. My favourite color is pink. So geuss what color of yarn I use the most. This pink tape would really be cool to have. So count me in. My email adres is hompeltjepompeltje @ gmail.com I will also ad a link on my website to this awsome give-away! Making fabric flowers.. I know, it's a bit lame, but I'm totally into it at the moment. I'm going to fill my house with fabric flowers, they're just so darn pretty and cute! I love any craft that involves working with paper. sewing, sewing, sewing! and a little bit of crochet. knitting. and see what craft people do!!! I like sewing and cross stich, but I also like knitting and designing my own craf creations! Knitting, or is it sewing? No, it has to be both. Love the tape. This tape is so adorable. Thank you for your lovely blog. Sewing--as it's the one I've actually stuck with through the years! Sewing is my favorite and also the one that gives me the most grief. Am I the only one that finds their hobby to be taxing? I Love Knitting, Work with all kind os papers and Cooking. Special to do things for special occasions: Christmas, Birthadys, begin od the Summer, and so on. What adorable tape! I knit! My favorite craft of the moment is felting. It feels so delightfully fallish, and is just so cozy. I also quite love papercraft, sewing, and cooking! If you can count photography as an art, that is my favorite. I also like to sew and work on paper crafts. I love making hair "things". Clips, headbands, anything along that line! Eeek! Cuter than cute! L-O-V-E the packing tape. My favorite crafty hobby is sewing/quilting. I try to get a little bit of time in my creative space each day, even if I only cut fabric for my next project or clean up all the scraps that seem to accumulate. It makes me happy! Japanese Embroidery (japaneseembroidery.com). I'm graduating at Phase X class in a couple of weeks! Knitting! I'm making a scarf today and am also teaching a friend how to knit. have a lot that are my favorite! knitting would be it for the season! ooo I can't choose. Knitting? Baking? Felting? Learning random new crafts that I'll only try once in my life? Hmm... I'm going to go for *blogging* on whatever I manage to create. Blogging is a craft, right? I love doing mixed-media art. I'm a fan of crochting. Right now my favorite craft is crochet, but it changes unexpectedly to quilting and embroidery. Every day I have another favourite! But with the winter coming, knitting is my topfavourite at the moment! You're very kind to buy one for a give-away! Sewing at the moment, but as it gets colder knitting and crochet. I'm hoping to crochet a blanket for the first time this winter. It is a super cute tape and thanks for making a give-away! sewing, particularly hand sewing! Cute tape, love it! right now because it's chilly, i am into my knitting. Oooooh, I don't know if I could actually use the tape were I to win it, it's so grrreat! painting or making collages. LOVE the tape!! right at the moment it is freezer paper stenciling. have used it for shirts, bags, chair embeleshments...am wondering if i could do it on a pumpkin? I love to make aprons. Half aprons are my new addiction, reversible and with rick rack, ruffles, original bias tape, whatever I can think of. cross stitch - for some reason i find great pleasure in following the directions. How darling!! My favorite crafty activity is embroidery! I love making memory boards! BAH!!! I am SO VERY in LOVE with this packing tape!!!! I used to live in Russia and am an ardent russophile. :) I even have Matryoshka doll measuring cups! I love all things crafty, but my favorite right now is sewing and crocheting. Ooh, I love sewing and bookarts...I think altered books are my favorites lately. definitely sewing (& reading crafy blogs!). Love that packing tape! Sewing, in particular softies. Thanks! Either crocheting or painting pottery. :-) And I love matryoshkii! Sewing - clothing and quilts! Is drawing a craft? If not, I choose origami. My favorite craft would be doodling on photoshop and printing my doodles out on 4x6 paperto make pretty little postcards. that tape is insanely cute... love it! I just learned to make Japanese lucky stars, so I'm kind of obsessed with that. Usually I would say sewing, though. my favorite craft is paper cutting. feel free to join my giveaway too. Papier mache is always fun! Thanks for the chance! I love matrioshkas! I love to reading all handcraft-er blog tooo..
tissue paper watercolor splash with my three year old daughter! I like making fabric flowers! I wear them as accessories, & I know that I'm wearing something unique! I love hand sewing and embroidering cute little things out of felt. but also needle stitching and ofcorse needle felting! quilting is my passion but recently became addicted to art journaling. My favourite craft...I have so many, but right now, it must be knitting! OHHH! Sewing and painting, I think. Now scrapbooking. hmmm, sewing. in particular, embroidery! I also love working with felt, and quilting, and paper crafts too! I am crafty in all sorts of ways but my passion is quilting. Thanks for a sweet giveaway!! It's a beautiful fall Thursday morning and my answer would be sewing. If you asked me 2 weeks ago it would have been polymer clay..
O gosh. My favorite craft is drawing - no, sewing- no, beadwork - no, stamping - no,dyeing - no, origami - ohhhh I cannot pick! It is so hard to choose just one-I would have to say it is probably a toss up between sewing and jewelry making. Hi!! I like cooking, crochet.. and make crafts for children. I love my glue gun, but judging from the burns on my fingers she does not love me back. So I'll have to say I love my serger more and the sewing crafts he can run through like it's nobody's business! This is a great giveaway. I love matryoshkas. My favorite craft right now is sewing and knitting. I enjoy carving a lot, I recently was given my grandfathers old wood carving tools after he passed and I'm having a lot of fun with them. I just found your site via longthread- I think will be spending some time here! My favorite craft is sewing, but it is a new love still with "training wheels". I love this tape. kids crafts with my children: today one of them is sick and we made a Dreamcatcher for him, since at kindergarten they're having native indians as a leading theme this year! I spend most of my craft time knitting, but I secretly wish I were better at paper crafts. Pop-ups -- I wish I were a paper architect. I love sewing, feels like I could make anything with my sewing machine (and a little Google tutorial searching). I love everything. Sewing, knitting, papercraft! I enjoy making anything with glitter! Crocheting. And refashioning kids clothes (is that a 'real' craft?). I love so many... but ORIGAMI would be! Scrapbooking! and the tape is absolutely adorable! I love knitting but also scrapbook, bead and quilt, I pretty much just love crafts. I love playing with paper, particularly card making. Thanks for the chance to win some very fun tape. lately scrapbooking and knitting. Cute tape! i love crafts that start out life in the recycling bin! Thanks for the giveaway! And today I made the edible Mini Jack O' Lanterns! They look so cute! How cool is that tape!! So adorable. I sew and scrapbook (amongst other stuff). My favorite is making dog collars. thanks!!!!! I´m in love with this!!! !